Glass pendant, made from recycled stained glass and kiln-fused for strength, with enamel design, by Kerry Ellen, 2011. 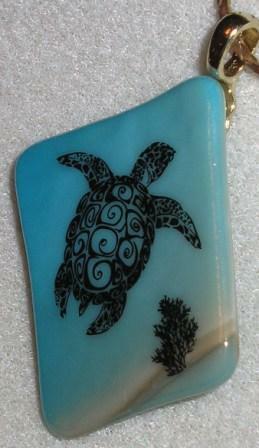 I made this pendant not too long ago – influenced by a friend who goes to Hawaii often and loves these turtles. It’s sad, but these delightful animals are becoming fewer and fewer. The link below tells about some of the turtles’ troubles and what is being done to help them.